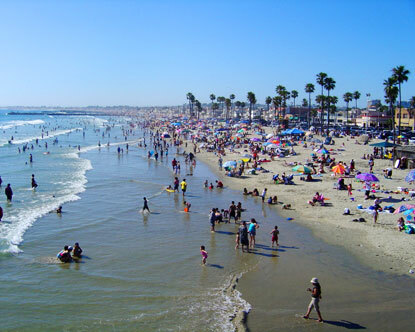 Although the area of Newport Beach is known for the harbor and love of the water, it also contains a hidden shoppers paradise. With the infamous Fashion Island and Balboa Island nearby, Newport does wonders for those who like activities yet enjoy shopping. Fashion Island is one of the best areas of Newport Beach, containing over 200 stores. The Island has everything you could ever want, from toys to expensive clothes. If you've ever tried Fashion Island before, you're probably aware of just how great it can be. With over 200 stores, it'll take hours and hours to explore everything here - and possibly even days. If you happen to be looking for an inexpensive, yet excellent experience, Balboa Island is where you should be going. The Island is accessible from Palm Street by ferry at the Balboa Peninsula, or by car/foot from Jamboree Road at the Pacific Coast Highway. With its great location and environment, the community is home to more than 80 galleries, gift shops, and fine restaurants. All along the streets on the island, you can find locals selling great merchandise, along with endors selling superb sweets and hot eats. When walking on foot on the island, you'll notice that there are wonderful views of the extravagent homes, harbor, and even the bay. Passing the street signs, you may notice that they are indeed named after precious stones, which is quite different. where shoppers will fall in love. With unique and attractive gift shops and sidewalk cafes, it's easy to spend hours here looking at everything you can purchase. and galleries as well. If hunger strikes, you can lose yourself in the tastefully impressive Balboa Bar, a bar made of vanilla ice cream that is dipped in chocolate. than just shopping - although the shopping here is something you must experience. shopping you won't find anywhere else.